The photos below were taken on 14 March at Norgrove Reserve, Mt Albert. 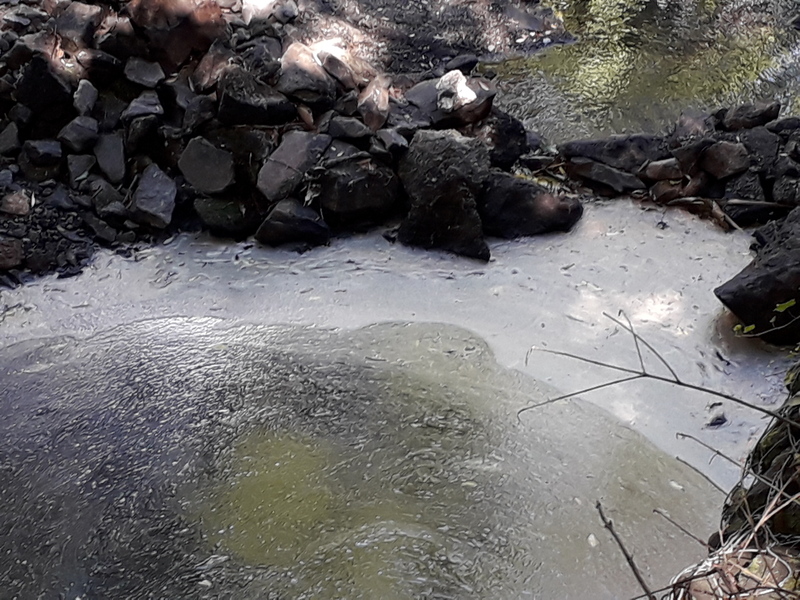 They show an unhealthy oily scum on Waitītiko Meola Creek, just below the 1 kilometer pipe coming from the Roy Clements Treeway. We were alerted by a local resident who had seen the problem growing over 2-3 days. We logged the problem (INR60218869) with Auckland Council Pollution Hotline., and 5 or 6 hours later received advice from Auckland Council. This was not a sewer overflow situation. The officer stated that both PH and ammonia measures were neutral. Therefore they could take no further action. They assumed it was pollen. According to the pollen calendar from Massey University, gorse and privet are the most likely pollens in March. Chamberlain Park rock forest, on the opposite right bank at this same location is riddled with a dominant canopy of mature tree privet 10+ meters tall. 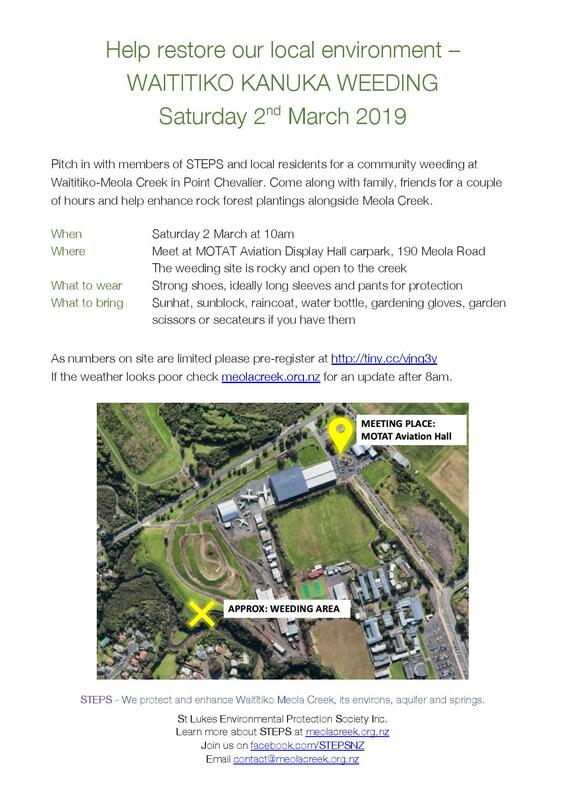 While Auckland Council states that “Auckland Council controls tree privet in regional parks and in parks with high-value ecosystems” they do nothing at this location to manage pests like privet or even possums and rats. 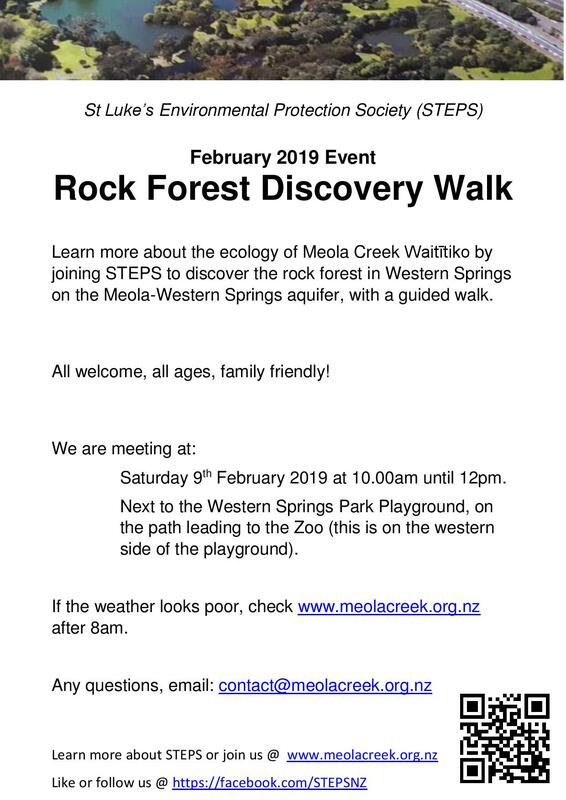 The rock forest is an outstanding natural feature, and the privet is complemented by a few mature titoki trees, with an understorey of puriri, kawakawa and other natives typical of a healthy lava rock forest. Less than 1% of an estimated 5000 Ha or lava rock forest remains in Auckland. We expect that with the significant budget and resource expansion of from the targeted rate for the natural environment, Auckland Council would hold true to its word and control this privet. To compound these issues a judicial review into Chamberlain Park redevelopment was lodged by golfing advocates pleading for their historic rights to an 18 hole public golf course. In June 2018 the High Court found in favour of Auckland Council who plan to allow access to Waititiko Meola Creek in Chamberlain Park. Currently this publicly owned stream in a publicly owned golf course is fenced off with no public access allowed ever. The Albert Eden Local Board required STEPS volunteers to cease our work in controlling privet and asparagus weed here. The reason given was that the court might misinterpret our work as part of AC’s redevelopment. We believe it is time for Auckland Council to address and inform the public on exactly why we are not allowed into this unfenced area to carry out pest control work which their own staff are not doing. 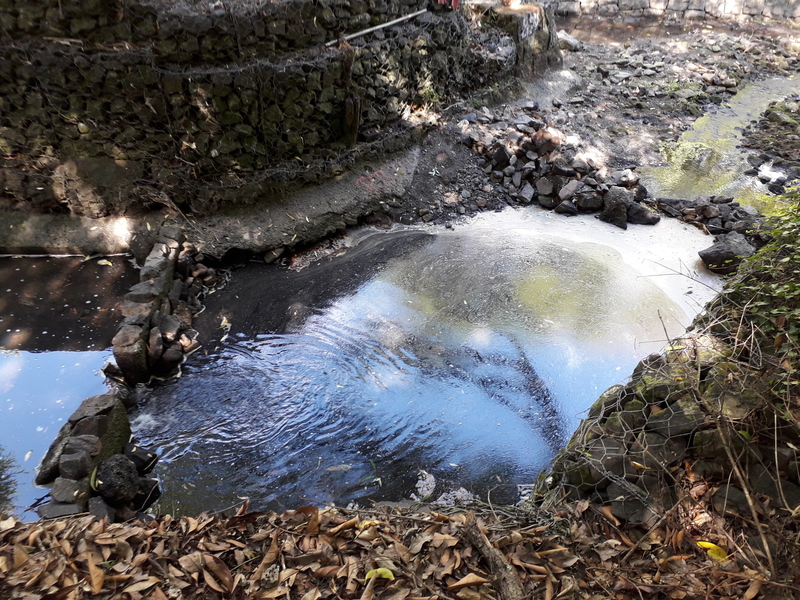 Auckland Council and Watercare Services separate sewers and release Waititiko Meola Creek from the burden and threats of piped sewage from the upper reaches of both Waititiko Meola Creek and Waiateao Motions Creek.